In the last month I’ve had to come to terms with the fact that purchasing this house when we did was a huge financial error. It’s been hard, and I’ve engaged in a lot of self-flagellation over the subject. We closed on this house December 1, 2006. Two and a half years later, we’ve paid down our mortgage principal by $31K. We’ve also put about $19K into major home improvements — like new windows and hardwood floors — which should have increased the value. Zillow lists our house as worth $26K less than we still owe. My own best estimate, using more intelligently-selected comps, puts us upside-down by about $10K. Which means that we’ve lost at least sixty thousand dollars on this house so far. By contrast, we could have moved into a comparably-sized rental house for probably a thousand dollars less per month than we’re paying in mortgage. Just sticking that money in the bank would have given us another thirty thousand dollars by now, not counting interest. And we would likely have been in a nicer house and a more convenient neighborhood, as well. 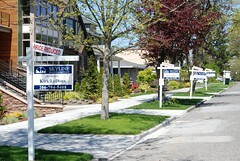 We were urged to buy — sooner than we’d planned, and with less money down — by our real estate agents and mortgage broker. I don’t blame them, though, or think they intentionally misled us. As far as I know, our agents and broker believed that they, and we, were doing the right thing. The catch-22 has always been that when real estate is climbing steeply — as it frequently tends to do in coastal cities, and had been in Seattle since I moved back here in early 1998 — it’s almost impossible to break in and buy that first house. 20% savings for a down payment becomes an ever-receding goal; by the time you have $60K saved up, that $300K house is now worth $450K and you need $30K more. Incomes don’t rise nearly fast enough to keep up. In 2006 we saw a rare chance to get our foot in the door, and we took it. To do so we had to compromise in location and quality from what we could have had as renters; the plan was always that this would be temporary — five to seven years, and we would be able to sell this one and buy a nicer one in a more convenient neighborhood. Hindsight is 20/20, of course, and today the collapse of the housing market is such a foregone conclusion that buying a house in 2006 seems like obvious idiocy. The housing crisis had already begun; why in the world did I jump on that patently rickety bandwagon? March 2006, Bankrate, Top 30 Markets to Watch: Seattle ranked high on the ‘housing will continue to appreciate’ list. September 2006, Forbes, How Low Will Real Estate Go? : In contrast to most cities, Seattle’s projection shows about three years of very minor appreciation, but values up almost 60% at the end of ten years. September 2006, Seattle Times, Home prices’ long rise: Is the end near? : “If history is any indication, King County may escape” the national housing bust. A local economist estimated that “appreciation will slow to 2 to 3 percent a year”, while the chief risk officer for PMI Mortgage Insurance explained why Seattle was relatively unlikely to see prices dip. I thought I was being conservative in my projections; I was prepared for a couple of completely flat years, with a mere two percent annual appreciation otherwise — worse than what anyone was imagining at the time. Instead we’ve had two roughly flat years followed by at least a 10% drop in the third. It pains me terribly every time I think about how much better off we’d be if we’d continued as renters, but wallowing in regret doesn’t really help anything. So I am trying to focus on the positive: we aren’t in danger of foreclosure; we still have a positive net worth; and we can wait years before selling this house if we need to. Meanwhile, I have very viscerally learned the investing adage that ‘past performance is no indication of future results’, and it’s left me a much more cautious person. Great post. We bought our townhouse in the Seattle area in March 2007 and are just now in the process of going through a short sale to unload it. We accepted an offer for $130,000 LESS than we paid. It’s so maddening. But we’re afraid it will be worth $50,000 – $100,000 less next year, you know? And the house does not work for us, we hate it and are tired of paying a fortune for it. Had we invested the more than $100,000 profit we made from selling our previous house in October 2006, and rented instead of purchasing this place, we’d be rolling in dough. I also continually beat myself up about it, but try to remind myself we made the decision we thought was right at the time. And we weren’t trying to impress anyone or flip it to double our money or anything like that—we just wanted a home near the school we thought our son would be attending for the next 9 years. I was going to get a part time job to help pay the mortgage. I didn’t know that I would have a health problem that would prevent me from working, our son would hate the school and have to leave it, and housing prices would drop 22% in our area. This has got to be a character building experience, right? :-) We’re moving to a rental shortly and our rent is more than $1000 less than our mortgage. Hallelujah, can’t wait for that. Lili: Nice to hear from someone in a similar boat. I do sometimes think about cutting our losses like you describe, but our situation is not so clear-cut (we’ve paid a lot extra into the mortgage already, and depreciation on single-family units has been slower than on townhouses, so we’re only a bit underwater). I think sticking it out for a few extra years will be the smarter choice, but it’s so hard to know! Maybe it’s just the sunk cost fallacy at play. K – Thnx for providing such an honest assessment, you rock! We bought our vacation property in 2007 after the downturn and saved about $100,000…. too bad there were foreclosures and things got worse in other condos and values continued to plummet another 100K+! Ouch! That said, if you think about it, this is just a psychological thing. If we were still in a raging bull market, what would we do? We’d still drive up to Lake Tahoe and enjoy our place… hiking, golf, biking during the summer, and snowboarding during the winter. We plan to retire there and therefore the value of it is immaterial. It’s just a psychological bummer. I’m so excited about this downturn since we have rebounded. It’s about taking advantage of sellers now and buying those short sales and such. We’ll be kicking ourselves in 15-20 years if we don’t buy now among the carnage. Hang on and enjoy your house! I can sympathize with the plight you are enduring. I did that prior to 2000, and luckily the recession hasn’t hit us as bad. I have still maintained a job (good thing since it’s our only source of income in the house), and that is with 4 kids tagging along. I think that it’s excellent that you’re still able to save while paying down the mortgage! Whether you have a long term mortgage (i.e. 25 years or more), or a shorter term mortgage (20 years or less)? The reason that I ask, is because my wife and I have come to terms that we want the house paid for before I reach retirement age (she’s 7 years younger than I am). As it stands now, it should be paid off by the time I’m 58-59. To accomplish this we refinanced to a low rate (4.625%) short term (15 year) mortgage, with very little closing costs ($3,000 or so … paid at the time we refinanced, not added to the principle). We did several things with the house including landscaping, finishing the basement, etc. and rolled that up into the primary (and only) mortgage. Our 17th payment was just made this month, which brought the principle down by 6.9% since we refinanced. From the very first payment more money went towards paying down principle than went towards interest … this is true of any 15 year mortgage at that rate. We also had the luxury of putting 20% down on the house to start with back in the year 2000. The compounded annual growth rate (CAGR) for our house is roughly 5.54%-6%/yr. That is as of 2009. We’re still at 70% LTV after having put about $50,000-$55,000 into the house to better fit our wants (more so than our “needs”). I’m wondering if you may want to stave off saving any more ($40,000 should be able to carry you for a while I would think), and focus on paying down the secondary mortgage. That will make it much better for you in the long run if the market still keeps going down in your area (I truly hope that doesn’t happen). Thank you for sharing. It’s very usefull. Hope to hear more from you.